The bathroom is usually the place we prepare ourselves for the day ahead and so it is important that it is organised and uncluttered thus allowing us a gentle transformation from our slumber through to looking our best, as we set out on our daily lives.It is also the place we probably look forward to most when we return at the end of the day, somewhere to relax, unwind and ease the repetitive pressures of our hectic lives? 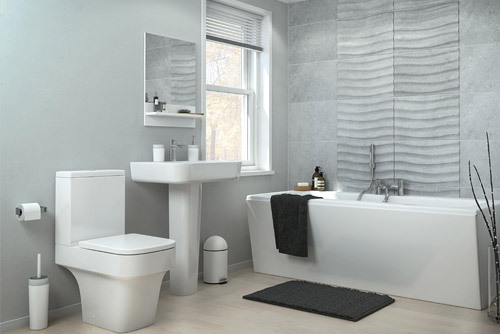 Here at Oakleaf we have the expertise to transform your bathroom and may be able to offer different design layouts for even the smallest of rooms, utilising the most awkward spaces to create a practical yet stylish bathroom. We have access to a vast array of products from household names such as Ideal Standard, Mira, Matki & Twyfords along with our own in house brand called Pure, all of which allow us to offer you a competitive price for your new relaxing indulgent retreat where you can unwind and soak away the stresses of the day. So if you considering updating your bathroom, why not invite one of our specialist designers to call and discuss your requirements and help take you through the process of choosing all the elements required to create your perfect haven of peace and tranquility. Once the design and price have been agreed, then it is passed to our experienced fitting team to turn your vision into reality in the shortest, most un-disruptive way possible. Once completed our customer service is always available should you require any further help or advice.